The integrated project carried out at Goleto has involved and reinterpreted numerous parts of the monastic whole and of the rural spaces near it, establishing a dialogue with the place, creating new spaces, new suggestions, new ways, new visions, new places. The new carried out hand-manufactured articles (wallings, floors, coverings, stairs, pavings, fittings) all artisan, designed and made on the stocks, with material of the place, with the mortars derived from the smashing of the stones and crocks found there, integrate themselves with the altirpin territory, reinterpreting nature and history in a new contemporaneous scenery. The proposed intervention prevides the repair of a “spatial pot” for the public placed in the rural district surrounding the Goleto Abbey. 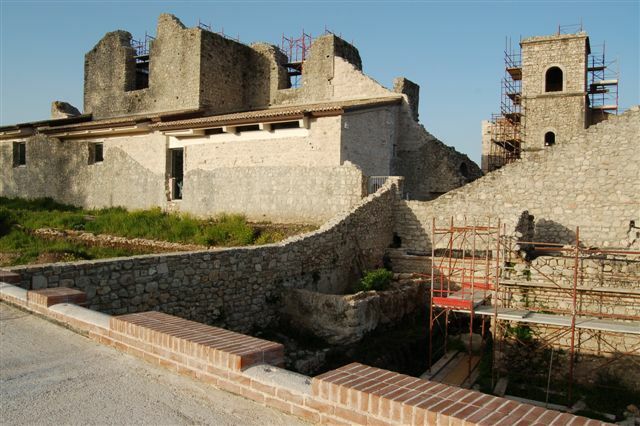 The Goleto site, for its historical and archaeological importance, holds primary importance for the commune of S.Angelo dei Lombardi and the whole altirpin territory for increasing tourism in the territory. The intervention will be made in an area of 5,000 square metres. The restored “spatial pot” will exploit better a monument of great historical importance, dating back to 1130, a true jewel of the medieval architecture of middle-southern Italy; Pot and Abbey form, therefore, an architectonic, urbanistic and naturalistic context of remarkable value. Memory of the white dried in the sun rural spaces where the fairs of cattle took place. The calcareous gravel has been rematerialized with the stone little cubes of Bisaccia; slabs and basoli of Fontanarosa, pebbles of the river Ofanto; lime-trees – loved and imported by the Longobards – on the southern edge, in the valley; canal made of stones and play of water that recover for natural waterfall the sources of the Abbey recovered upriver. Angelo Verderosa (group-leader) with Giovanni Maggino and Franco Arcidiacono carry on from long time a careful work, in a difficult territory, for the exploitation and promotion of the altirpin context where they live. In 2005 they published “Il recupero dell’architettura e del paesaggio in Irpinia – Manuale delle tecniche di intervento”, De Angelis Editore, Avellino, 2005. “The deliberations contained in that volume urge to think about meaning of building in the past and above all in the future, about the manifold attentions inherent in every construction deed. In this experience environment and landscape matter, ecology and energy matter, seismic matter and the matter of the techniques coherent with the places and the culture of every area, the attention for what has been built and for the spaces that have not been built that are the essential part. On all these topics the deliberations carried on, are a testimony of practice, connection between theory and practice, and at the same time stimuli to searchs” (from the Preface of Massimo Pica Ciamarra). Angelo Verderosa , born in 1961 at Avellino, architect. Graduated in 1986 at ”Federico II” Naples with a dissertation on the individualization of a project methodology for post-earthquake Irpinia, is a winner of several national competitions of ideas. He has pubblished several texts (diaries of work) on the restoration and works realized in some reviews of field. Giovanni Maggino , born in 1973 at Bisaccia, architect. Graduated in 2000 at University of Studies of Chieti “G. D’Annunzio”, has taken part in several competitions of planning. He won at Campagna (SA) the competition for the realization of 110 lodgings ERP. Franco Archidiacono , born in Zurigo (CH) in 1973, architect. Graduated in 1999 at “Federico II” Naples, has taken part in numerous competitions of planning winning as a student “Un edificio per la musica ad Avellino” and in 2000, “La realizzazione della nuova biblioteca comunale di Pistoia”. He is a trustee of Slow Food “Baronia”. “The recovery of architecture and landscape in Irpinia – handbook of the technics of intervention”. “A building for music at Avellino”. “The realization of the new municipal library at Pistoia”.